We know you may find the prospect of designing your website a bit daunting. After all, a great website design is a masterpiece composition of text copy, colors, fonts and images, all carefully chosen and blended to show case your Brand and your messages. That's why we carefully designed our Style Wizard to be deceptively simple, yet powerfully comprehensive. We have distilled the process down to six simple steps, so you can easily, and quickly arrive at your masterpiece custom website design for your business. 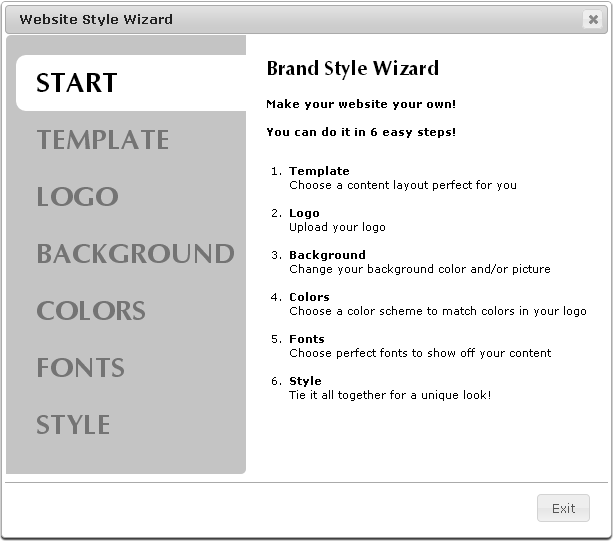 Launch the Style Wizard to craft the exact look you need for your business in one hour! Your custom design in 6 easy steps. Upload your logo, crop and resize it to perfection. Fine tune every detail of anything and everything to your heart's satisfaction.